The partnership is focused on UW-Stevens Point’s academic programs with MCHS’s clinical training opportunities, and to further develop UW-Stevens Point’s health-related programs by having the Health System’s input on program development, to assist with the recruitment and retention of talent in northcentral Wisconsin. “UW-Stevens Point and Marshfield Clinic have both been regional leaders for more than 100 years. We’re committed to responding to needs of the communities we serve. This partnership will further strengthen our ability to meet the growing need for health-related professionals to serve central and northern Wisconsin,” said Chancellor Bernie Patterson. An aging health care workforce and statewide staffing shortfall makes this partnership especially important and timely. The Wisconsin Center for Nursing projects a shortage of 1,000 nurses annually. Expansion of existing degree programs and establishment of new health-related majors, minors and certificates. New programs include a master’s degree in health care administration and doctorate in physical therapy. Bachelor’s degree programs would expand in several health care professions, including nursing, dietetics and clinical laboratory science. Development of a Marshfield Clinic Health System Scholars Program that partners top UW-Stevens Point students with opportunities at the Health System for practicum and clinical experience. Additional academic offerings at UW-Stevens Point at Marshfield and Wausau branch campuses. The Marshfield Clinic Health System Scholars program will identify top-performing students in health-related fields at UW-Stevens Point who have an interest of staying in the region after graduation. Scholars will receive tuition assistance and have additional training and mentoring opportunities. An advisory board of health care and education professionals across Northcentral Wisconsin will be established to provide advice and direction to UW-Stevens Point. This advisory board will include MCHS representatives who will have input into strategic planning, make recommendations on new programs, and increase advocacy and awareness about health education. Demand for positions in the health care industry continues to increase as the aging population in Northcentral Wisconsin grows. According to the Wisconsin Department of Health Services, those ages 65 and older will increase by 640,000 people, or 72 percent, in the state by 2040. The population is rapidly aging in rural areas and is most pronounced in the northern half of the state. Marshfield Clinic first trained medical students in 1927 when it began a preceptorship program with University of Wisconsin-Madison. The university also will host a health careers camp for high school students each summer beginning in 2019. • In 1927, Marshfield Clinic began training University of Wisconsin (UW) medical students through a preceptorship program. • In 1987, the University of Wisconsin-Eau Claire College of Nursing and Health Sciences started its distance education nursing program at what is now Marshfield Medical Center-Marshfield. In the past 30 years, the nursing program in Marshfield has graduated 685 students. • The Marshfield Clinic Health System residency program has graduated 739 residents and 42 post-doctoral fellows since 1974 in specialties such as internal medicine, surgery, pediatrics, dermatology, internal medicine/pediatrics, psychology and palliative care and internal medicine. More than 80 of those graduates currently are caring for patients at Marshfield Clinic Health System. • Marshfield Clinic in 2009 became the first host site for medical students in the Wisconsin Academy for Rural Medicine (WARM) and has continued to serve as a teaching site since then. • Marshfield Clinic Health System is a clinical campus of the University of Wisconsin School of Medicine and Public Health. • Marshfield Clinic Health System and UW-Stevens Point have a history of collaborating on academic programs and partnerships in athletic training, clinical education and health coaching. • UW-Stevens Point offers health-related undergraduate and graduate programs in athletic training, audiology, clinical and counseling psychology, clinical laboratory science, dietetics, family and consumer sciences, health and wellness management, health information management and technology, health promotion and wellness, health science, nursing, social work, speech-language pathology, sustainable and resilient food systems, sustainable food and nutrition; and pre-professional options in chiropractic, dental, medical, mortuary, occupational therapy, optometry, pharmacy, physical therapy and physician’s assistant. 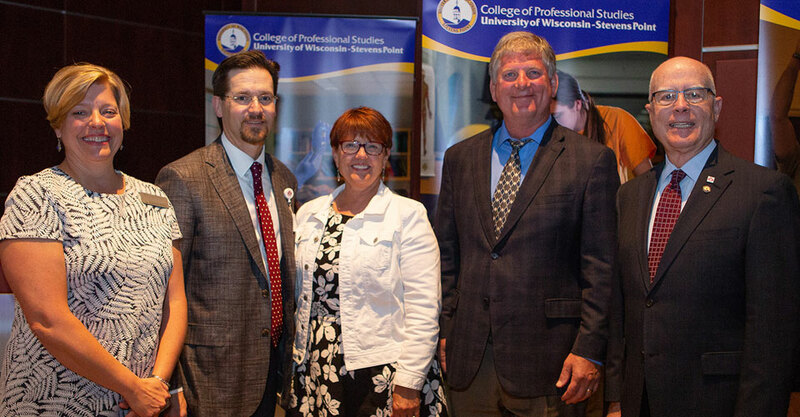 • UW-Stevens Point is committed to starting new graduate programs in health-related fields to meet the needs of students, employers and our communities. A Master of Science in Athletic Training program started in May 2018, a fully online Master of Science in Health Care Administration begins in January 2019, and planning phases are underway for a Doctorate in Physical Therapy program. • UW-Stevens Point began offering the RN-to-BSN Completion program for diploma and associate degree registered nurses to earn a four-year bachelor’s of science in nursing degree in 2013 and received accreditation from the Commission on Collegiate Nursing Education (CCNE) in 2015. • A clinical laboratory science-medical technology major has been offered since 1957 and has graduated 914 students. The majority of these graduates practice as laboratory professionals in hospitals and clinics in Northcentral Wisconsin. The CLS-MT program is one of the largest in Wisconsin, one of only three programs accredited in the state. • UW-Stevens Point established the first college degree program in wellness in the world, and in 2010, became the first in the U.S. to be accredited by the National Wellness Institute. Marshfield Clinic Health System (MCHS) is a $2.2 billion integrated health system serving Wisconsin with about 9,000 employees and over 1,200 providers comprising 86 specialties, health plan, and research and education programs. MCHS primary operations include Marshfield Clinic, Marshfield Medical Center, Marshfield Children’s Hospital, Lakeview Medical Center, Marshfield Clinic Research Institute, Security Health Plan and Marshfield Clinic Health System Foundation. Founded in 1894, the University of Wisconsin-Stevens Point offers more than 100 undergraduate programs, as well as graduate and doctoral programs. With 200 student organizations and a 280-acre nature reserve, the university attracts 7,700 students to enroll annually. UW-Stevens Point has two-year branch campuses in Marshfield and Wausau and is ranked among the best public universities in the Midwest.